SD/HD-SDI, HDMI and analog YUV, S-Video and composite video to H.264. Encode to digital H.264 files in real time from professional SDI, HDMI, analog component, S-video and composite video equipment! Get the highest quality 4:2:2 video capture from all popular SD/HD video formats. Connect video cameras and VTRs, including HDCAM, Digital Betacam, Betacam SP, DVD players and much more. H.264 Pro Recorder includes Media Express software for Mac OS X and Windows, which lets you preview and set the video quality of encoded files. The Blackmagic Design H264 Pro Recorder allows you to real-time encode professional SDI, HDMI, analog component, S-video and composite video equipment to digital H.264 files. Convert every popular SD/HD video video format into the highest quality 4:2:2 video capture output. Connect video cameras and VTRs (including HDCAM, Digital Betacam, Betacam SP, DVD players) and much more. Preview and decide the video quality of encoded files thanks to the H264 Pro Recorder’s included Media Express software for Mac OS X and Windows. The Blackmagic Design H264 Pro Recorder allows you to choose between SDI, HDMI and analogue component video inputs with selection between inputs - you can opt to take audio from the SDI, HDMI or stereo balanced analogue audio input jacks. The H264 can be connected directly to HD or SD video sources because the SDI, HDMI and analogue component inputs all switch between formats, allowing you to capture from HDCAM, Digital Betacam, Betacam SP, DVD players and more. Use the H264 to archive old footage, news programming and other materials that might be on old videotape formats, before the tapes deteriorate. With the H264 Pro Recorder, all captured files are digital, and in the popular H.264 file format, so your content will be preserved forever. 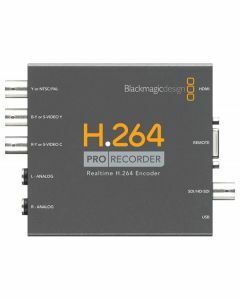 H.264 Pro Recorder is for the industry professional who needs professional encoding from SDI, HDMI, analog component/composite and balanced audio! H.264 Pro Recorder includes Blackmagic Design's powerful Media Express for frame accurate deck control with EDL import! Media Express lets you encode on Mac, Windows and Linux! • Highest Quality Video CaptureH.264 Pro Recorder allows you to select between SDI, HDMI and analog component video inputs with selection between inputs. You can select to take audio from the SDI, HDMI or stereo balanced analog audio input jacks. H.264 can be connected directly to HD or SD video sources because the SDI, HDMI and analog component inputs all switch between formats. This means you can capture from HDCAM, Digital Betacam, Betacam SP, DVD players and more! The perfect low cost way to capture from professional broadcast decks directly to SD and HD H.264 files! With new ways of delivering content to consumers, now it's easy to capture old or new programming content into the same file format used on the web, iPad™, iPod™, iPhone™, Apple TV™, YouTube™ and more! Capture directly from SDI, HDMI and component analog video with embedded SDI, HDMI and balanced analog audio inputs. RS-422 deck control is included with software for Mac, Windows and Linux! Old videotapes are delicate and have a limited life. With old videotapes deteriorating and decks that can play them getting rare, encoding video is the only way to preserve valuable footage! Use H.264 to archive old programming, news footage and other materials that might be on old videotape formats, before the tapes deteriorate and the content is lost forever. With H.264 Pro Recorder, all captured files are digital, and in the popular H.264 file format, so your content will never deteriorate and will be preserved forever! • Media Express Software Included! Blackmagic Media Express is included free with H.264 Pro Recorder. Media Express lets you batch capture your H.264 files with an attractive user interface that's a pleasure to use, even after hours of encoding work! You can even create your own playlist from captured files. Media Express also supports CMX EDL import and frame accurate deck control via RS-422, so you can fully automate batch capture of multiple H.264 files! Media Express is fast, accurate and easy to use and works on Mac OS X, Windows and Linux! Analog Video Input: 1 x Component YUV on 3 BNCs switchable to S-Video or Composite. Component supports HD and SD. Device Control: Sony compatible RS-422 deck control port. SD Format Support: 625i/50 PAL and 525i/59.94, 480p NTSC. HD Format Support: 720p50/59.94/60. 1080i50/59.94/60. 1080p23.98/24/25/29.97/30/50/59.94/60. 1080PsF23.98/24/25/29.97/30. SDI Compliance: SMPTE 259M and SMPTE 292. Multiple Rate support: SDI, HDMI and component analog video connections are switchable between standard definition and high definition. SDI switches between 270 Mb/s standard definition SDI, 1.5 Gb/s HD-SDI and 3 Gb/s HD-SDI. Encoding: Hardware based real time H.264 encoder supports multiple profiles for small, portable video devices through to full resolution HDTV. Realtime Scaling: Capture at full HD or SD resolution, or use direct resize in realtime to scale and encode for the intended playback device, such as iPhone, iPad or iPod. Software Included: Media Express, Blackmagic System Preferences and Blackmagic driver on Mac OS X. Media Express, Blackmagic Control Panel and Blackmagic driver on Windows. Internal Software Upgrade: Firmware upgrade via USB. Power Supply: +12V universal power supply included with international socket adaptors for all countries. Cable tie point. Requires computer with a USB 2.0 port.